The real target of Turkey's intervention in Syria is not the Islamic State or the Assad regime, but the Kurds. The latest events in northern Syria constitute a bold move by the Turkish leadership to deal with a most pressing problem, from its point of view. That problem is not the continued existence of the Assad regime, far to the south. President Recep Tayyip Erdogan would certainly like to see the end of this regime. But its continued truncated existence between Damascus and the coast and in isolated spots elsewhere does not constitute an immediate danger for the Turkish leader. The issue is also not Islamic State. Certainly the killing of a Turkish soldier in a firefight on the border near the town of Kielis with Islamic State terrorists last Thursday will have angered Erdogan. But this alone cannot explain the sudden dramatic series of moves in subsequent days. After all, until now, the Turkish government's attitude toward Islamic State had been one of tolerance and at times cooperation. Recent revelations indicate a laissez-faire attitude toward Islamic State oil trading across the border, and to the transport of fighters across the border. Neither the Assad regime nor Islamic State constitutes an immediate danger for President Erdogan. Ankara's stated intention of using its air power to create a 90-km. wide area of control between Jarabulus and Marea along the Syrian-Turkish border is directed against the ambitions of the Kurds, not those of Islamic State. Since January, Kurdish political stock has been steadily rising in the West. In the Kurdish YPG (Peoples' Protection Units), the US found a reliable, non-Islamist ally that was willing and capable to act as a ground force against Islamic State in northern Syria. The combination of the YPG on the ground, and the USAF in the skies proved sufficient to save the besieged town of Kobani, and then to push the jihadis back to Tel Abyad in the east and to the outskirts of Jarabulus in the west. Syrian Kurdish political stock has been steadily rising in the West, worrying Turkey. These victories, however, were worrying from the Turkish point of view. First, as a result of their eastern advance, the Kurds were able to unite two of the three cantons they have established along the long Syrian-Turkish border. The creation of a corridor linking the Jazira canton, which stretches from the Syria-Iraq border to the town of Sere Kaniye (Ras al-Ain), with the reconstituted Kobani enclave gave the Kurds control over a long and contiguous stretch of border. No less important, the favorable publicity accruing to the Kurds because of their fight against Islamic State, and the presence of women fighters and secular Western volunteers in their ranks, served to turn the Syrian Kurds from a forgotten minority into the recipient of favorable and growing Western attention. Still worse, from the Turkish point of view, the entirety of the remaining border area not under Kurdish control (with the exception of a tiny enclave around the town of Azaz) was in the hands of Islamic State. The logic of the situation thus appeared to suggest that a Kurdish offensive west of the Euphrates to drive Islamic State from the region, with the help of US air power, might be in the offing. Turkey's intervention was designed to preempt a US-backed Kurdish offensive to drive Islamic State west of the Euphrates. An offensive of this kind would have driven Islamic State from the border in its entirety. But it would almost certainly have had the additional effect of enabling the YPG to unite the Kobani enclave with the third Kurdish canton in northern Syria, established around the town of Afrin. This, in turn, would have given de facto control of the entirety of the 800-km. border between Syria and Turkey to a Kurdish autonomous entity ruled over by the PYD (Democratic Union Party). The PYD is the Syrian franchise of the PKK (Kurdistan Workers' Party). The PKK is (or was) engaged in a stalled peace process with the government of Turkey. Core issues remain unresolved. Erdogan could not tolerate the emergence of a de facto Kurdish sovereignty stretching along the entirety of this border. Hence the evident decision to intervene in northern Syria using air power. This is an attempt to mimic the successful pairing of US air power with Kurdish ground force that has driven the Islamic State back to the east and south. Erdogan wants to pair his air force with Sunni Islamist rebels in Aleppo and Idleb provinces, in order to destroy the Islamic State stronghold between Jarabulus and Marea. At the same time, as seen this week in the town of Zor Maghar, force will also be employed to deter the YPG from making any move west of the Euphrates. 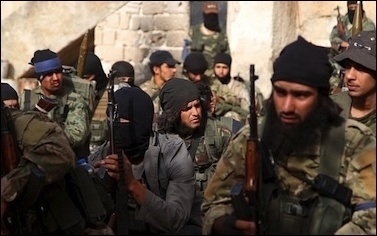 The anti-Islamic State rebels Turkey will be helping include Jabhat al-Nusra, the Syrian franchise of al-Qaida. The Sunni rebels in question will almost certainly be the Jaish al-Fatah (Army of Conquest). This is a Turkish-, Qatari- and Saudi-supported gathering of Sunni Islamist forces, which includes Jabhat al-Nusra (the Syrian franchise of al-Qaida) and Ahrar ash-Sham, a powerful Salafi armed group. If this venture is successful, the end result will be the removal of Islamic State from the border in its entirety, and its replacement, between Kobani and Afrin, by other Islamist rebel groups supported by Turkey. This is the mission on which Erdogan is now embarked. It appears to have dimensions beyond northern Syria. The attacks on the PKK in Qandil and the threats to strip HDP (Peoples' Democratic Party) parliament members of immunity may point to a broader political logic. Erdogan may be seeking to leverage the crisis with the Kurds for political gain, fanning the fires of Turkish nationalist sentiment to mobilize votes in a renewed general election. He may be hoping to achieve the sought for parliamentary majority, which eluded him in elections earlier this year, and which he needs to bring about constitutional reform and expanded powers for the presidency. But most urgently, the Turkish move into Syria is directed against the advances – physical and political – made by Syria's Kurds in the course of the past year. Just how far Erdogan will go in pursuit of the goal of turning back the clock in Syrian Kurdistan remains to be seen. But contrary to much Western reporting, Turkey's entry into the war in Syria does not constitute a belated reconciling by Ankara of a Western-led agenda vis-à-vis the war. Rather, Erdogan is carrying out a bait-and-switch move, founded on partnering with Sunni Islamist groups in order to reduce or destroy Kurdish aspirations. Jonathan Spyer, a fellow at the Middle East Forum, is director of the Rubin Center for Research in International Affairs and author of The Transforming Fire: The Rise of the Israel-Islamist Conflict (Continuum, 2011).